Now that autumn is well and truly here in the UK and the colour in our gardens is fading, why not think about adding some colour inside your home instead? Orchids are one of my favourite houseplants. I love their elegant blooms and if they're kept in the right conditions, they can be in flower for a very long time. There are lots of different types of orchids, but one of the most common ones you'll find on sale is the Phalaenopsis orchid, pictured above. It can flower two to three times a year and the blooms generally last between two to six months. Place your orchid plant in a well-lit spot, but out of direct sunlight. They like a room temperature of between 20 and 22 degrees Celsius. Keep your plant out of draughts and don't place it near a radiator. Always water the soil rather than the plant. 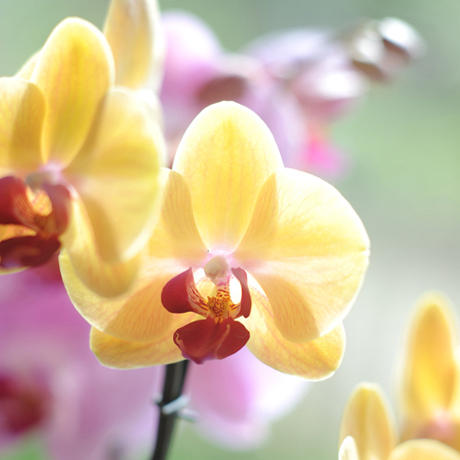 Feed the plant about twice a month with special orchid food between March and October. Keep your orchid drier in the winter than in the summer. They rest in the winter, so only water occasionally. So, if you're looking to add a pop of colour to your home this autumn, why not buy an orchid plant? They come in a diverse range of flower shapes, colours and patterns. And they're readily available from florist shops, garden centres and supermarkets.